Get outside to celebrate and enjoy winter! 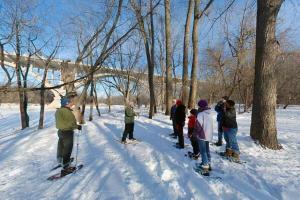 REI experts, Fort Snelling State Park and local outdoor organizations will provide free activities that show how fun winter can be. Activities include: snowshoeing, naturalist lead hikes, learn to keep warm outside in winter, cold weather camping information, learn to build a quinzee and much more! We will provide hot cocoa and a big bonfire to warm you up. Bring the family out to celebrate winter in Minnesota! This is not an official Scouting event. It's open to the public. Call (612) 279-3550 or Visitor Center (612) 725-2724 for more info.